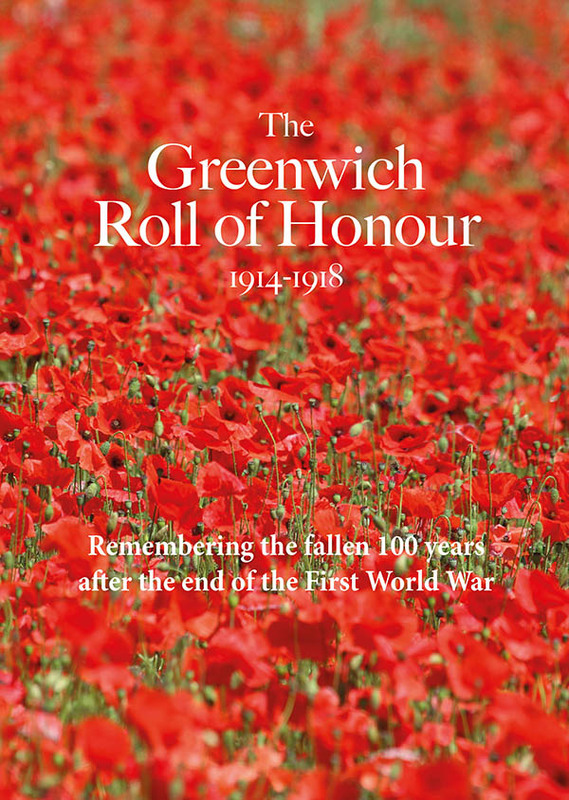 Articles on Greenwich.co.uk that mention King William Walk in Greenwich - a handsome mainly-residential road which goes from the St Mary's Gate of Greenwich Park (northern entrance) all the way to the Cutty Sark. I know there’s nothing more quintessentially British than a cup of tea, but these days as you walk through Greenwich, you’re more likely to come across people clutching a coffee. With a seemingly ever growing menu of coffee options available, Greenwich.co.uk picked the classic caffè latte for the latest in its series of taste tests. The only tourists you’ll ever see in Buenos Aires would be very lost ones. Located at the top of Royal Hill, it’s very popular with locals and is busy throughout the day, particularly in the morning after the school run. If you want to linger, there’s several tables inside and out, and a few leather sofas. The key to a successful latte is, of course, the milk, and they certainly got it right here. The latte was perfect, in my opinion. The coffee was just on the right side of strong, and the froth on the top provided a good amount of milky goodness, but not too much. This may have been the most expensive latte in my taste test, but it was also the best. This tiny café aims to replicate a French café in East Greenwich, just a few steps away from the Arches Leisure Centre. When I say tiny, I mean tiny—there are only seven seats in the café, and not a lot of space beyond that. But what it lacks in space, it makes up for in taste. The latte I had was very French, as you might expect, in that it was very strong. There was a decent amount of froth on the top, but it didn’t do much to lessen the strength of the coffee. But given that it was pouring rain on the day I had it - that statement pretty much sums up our spring - it was just the sort of boost I needed to get me through the afternoon. L’Artisan may be small, but it packs a big latte punch. On yet another dreary wet morning, I was there for the latte and was not disappointed. It had a good ratio of milky froth to coffee and the coffee itself was strong without being overpowering. Even the small size is more generous than the others tasted. Rhodes uses Union Coffee, a specialty artisan roaster who trades directly with coffee farmers, ensuring fairer prices for the farmers. 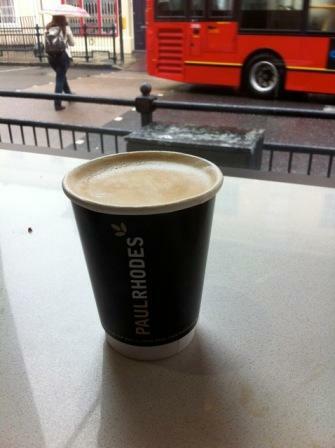 Rhodes also uses a biodegradable insulated coffee cup and lid, which is fully compostable, the first of its kind in the UK. Will I be back? Absolutely, though I won’t be back just for the coffee. On my rainy morning, the almond croissant I enjoyed went a long way to making my day better. Any discussion about Greenwich coffee has to include Red Door on Turnpin Lane. The quirky cafe, shop and gallery serves up Monmouth Coffee, the best coffee in London in my opinion, if not the world. Add to the mix the charming owners and you’ve got a winner. It is a busy place. Even in the mid-afternoon, when I visited, I had to wait for a bit to get my caffeine fix. But I was more than happy to bide my time, with the classical music on the stereo and the interesting art on the walls. 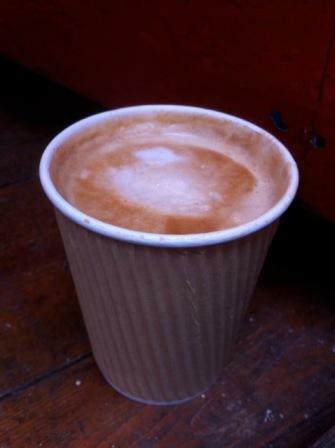 The latte, as expected, was delicious due to its source material of Monmouth Coffee. Although this is the type of place where I think they’d much prefer that you stop and smell the coffee, I was able to get my latte to go. 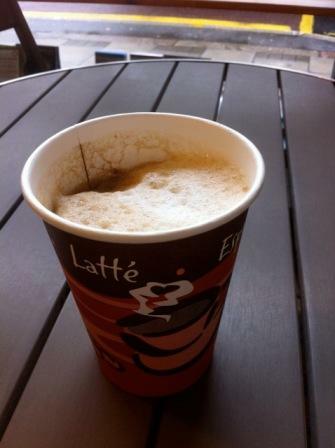 If latte is not your thing, they also offer the standard hot drinks of espresso, Americano, cappuccino and tea. Red Door is unique and that’s what makes it special. The people who scurry past to get to a chain coffee house don’t know what they’re missing. Red Door might not be the most conventional coffee house you’ve ever been to, but it certainly is one of the most memorable. 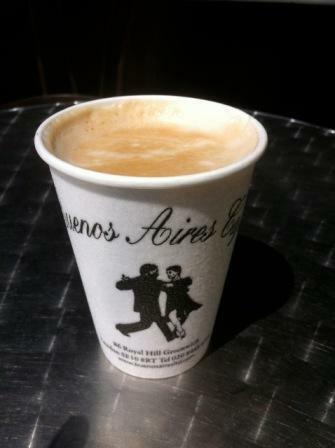 Buenos Aires had the best take away lattes, but all of the establishments had excellent reasons to visit. I have no doubt that I will return to all of them very soon, for either a coffee to go or a cake on a sofa. GODDARDS at Greenwich opened its doors to hungry punters yesterday, marking a return to Greenwich after a six year absence. The much-awaited return of the family-run pie shop, along with a new pub opening, two new exhibitions and a surprise gig by the most famous band to have come out of Greenwich made it Super Thursday in SE10. It was as if Goddards had never been away as customers at the new 100-seater restaurant in King William Walk tucked in to pie, mash and liquor while listening to classic songs like 'Roll out the Barrel'. "We've been looking to come back to Greenwich for such a long time and we're fortunate to have found such a lovely building. We're looking forward to seeing all of our old customers again, getting back into the community and letting everybody enjoy our pie and mash." As Goddards at Greenwich closed after its first day back, the party was just getting started round at The Lost Hour in Greenwich High Road. The Stonegate pub, formerly The Auctioneer, relaunched after a two week refurbishment and laid out the red carpet for its surprise mystery guest - top David Beckham lookalike, Andy Harmer (pictured right). Elsewhere in Greenwich, a new gallery space opened up on Creek Road. Made in Greenwich features a range of works from a variety of disciplines, and the opening exhibition, which includes work by Edward Hill, Mike Curry and Tom Dingley amongst others, is dedicated to Greenwich Park. At the Ben Oakley Gallery in Turnpin Lane, Greenwich Market, it was the opening night of an exhibition by Dartford-born artist David Bray called Far Out Is Not Far Enough. Greenwich's Super Thursday ended with a surprise gig by Greenwich legends Squeeze at the Pelton Arms. It was the band's last gig before jetting off to the US for a tour that starts in San Diego on Tuesday. "Awesome night at the pelton arms. To see The Squeeze in your local is a real treat. And they were brilliant!!! ", tweeted one audience member lucky enough to see them play. The splurge of new openings comes just days after the opening of two restaurants in the Greenwich Pier development. Byron, purveyors of "proper hamburgers", and Frankie & Benny's both opened for business this week. “Greenwich is one of London’s most iconic locations, as popular with visitors as it is with locals. We’re excited to be bringing proper hamburgers to this historic maritime location,” says Byron’s founder, Tom Byng. 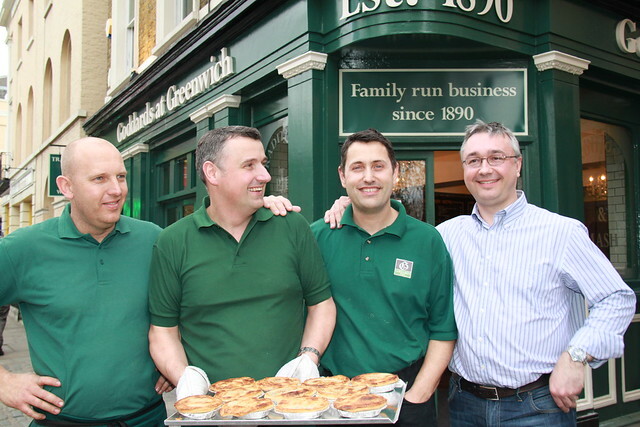 GODDARD's Pies is to return to Greenwich with the opening of a new shop. 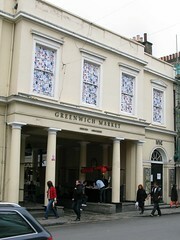 The family business's new shop will be in King William Walk, replacing Greenwich Inc's Great British Fish & Chip shop. Goddard's was established in Deptford by Alfred Goddard in 1890 and then for many years they had a shop in Greenwich Church Street. Kane Goddard of Goddard's Pies told Greenwich.co.uk: "We've been away far too long and we look forward to seeing some familiar faces and lots of new ones in our pieshop. 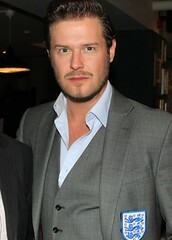 2012 is an exciting year for many reasons and we can't wait to re-establish ourselves within the Greenwich community." The venue for the business is an 18th century pub, originally known as the Cricketers, and has had various incarnations in recent years such as the W Lounge, Powder Monkey and Lani Tiki. The shop should open for business in April after a refit that's expected to take around three weeks to complete. Greenwich Council has initiated a consultation on proposals to part pedestrianise Greenwich town centre. The pedestrianisation scheme would entail closing College Approach and King William Walk (northern section) to all traffic except for access. Greenwich Church Street north of Creek Road would allow some traffic access. Option 1 – two-way traffic on all the non-pedestrianised roads. Option 2 – create new clockwise traffic gyratory with one-way traffic flows on Norman Road and the affected stretches of Creek Road, Greenwich Church Street and Greenwich High Road. 2a – As Option 2 but with two-way movement permitted on Greenwich High Road southwest of Stockwell Street. 2b – As Option 2 but with a bus contra-flow on Greenwich High Road – Greenwich Church Street – Creek Road. 2c – As Option 2 but with a cycle contra-flow on Greenwich High Road – Greenwich Church Street – Creek Road. The proposed options can be seen in detail, along with a visual computer model, at an exhibition being held at Devonport House on the 19th/20th/21st December between 10am - 8pm. More information is available from the Council website. I wasn’t expecting a lot from this place. I was expecting a bland, chain-style tourist trap. Humble pie time I’m afraid: someone’s clearly put a lot of thought into the (new) new look Bar & Kitchen and has carved out a well-defined and satisfying niche. The Bar & Kitchen wouldn’t be too out of place with an ‘EC’ postcode and a few Friday night suits, which is actually a refreshing change amongst the town’s raft of ‘local’ pubs with a posh edge (read Gastropubs). The décor is quite dark but stylish: some well-spaced wicker sofas and fairy lights at one end, and a formal dining area at the other. Where the Union does Ales, the Bar & Kitchen does cocktails, with a list more extensive than the food menu. There’s also happy hour from Monday to Friday between 5pm and 7pm, where the cocktails are £3.95 rather than the usual £6 or £7 (cue happy suits and stilettos). The menu focuses on a few select dishes that presumably change regularly and I was intrigued to see Macaroni cheese on there; very random in June but it beats veggie lasagne any day. The barman was friendly and took an interest in my unusual choice of vodka and apple juice with lime juice. Actually, what happened was he misheard me when I asked for cranberry juice but he made such an effort with the banter about me inventing a new cocktail, that I didn’t have the heart to tell him he’d made a mistake (plus I was secretly hoping “the Rosie” would make it onto the cocktail menu!). Other than that there was a wide selection of lagers and a few wines to choose from. I don’t imagine anyone’s socks will be knocked off by a visit to the Bar & Kitchen, but it is a pretty little place with a clear agenda and that makes it a success as far as I’m concerned. Amidst a sea of local, country-ish pubs with real ale and pies, you need a few fairy lights and cocktails every so often, so if mojitos are your thing I’d say give this place a(nother) go. AS THE proposals to redevelop Greenwich Market start their journey through the planning process, we need to be clear about two things. Firstly, the current plan is not substantially different from Greenwich Hospital’s discredited 2006 scheme to demolish the Market, dropped after a public outcry. The main difference is that this time the PR operation has been smoother. Secondly, the plans – whether you like them or not – represent a fundamental transformation, changing a nineteenth-century market into a 21st-century shopping precinct with added market stalls. “But it’s not nineteenth-century,” I hear you say. The buildings lining the two longest sides of the market are from the 1950s. That is, of course, perfectly true. But somehow, despite that. the market feels old. The key to that feeling lies in two things – the low ceiling, and the cobbled floor. In the new scheme, both of those things will be destroyed. Artists’ impressions of the scheme show what is now the central market area covered with a high, contemporary, plastic or membrane translucent roof, supported by at least sixteen thick stainless-steel pillars. The current roof hides the Fifties buildings. The new roof would be at least two to three storeys high, exposing the new contemporary buildings to be constructed either side. It looks like a closed-sided version of Stratford bus station – a building I admire, and which works well in a modern setting like Stratford, but which is wholly out of keeping with the historic centre of Greenwich. It is a world heritage site, folks – you do know we’ve only got four of them, don’t you? The lowness of the current roof contributes greatly to the intense, warren-like atmosphere of the market, a place which feels like a hunting ground for hidden treasure, or at least scented candles. The new version has as much intensity and excitement as the central square at Bluewater. The other thing that makes the market feel old is the cobbles. These, too, will be ripped up, in favour of standard setts and slabs. Health and safety, that evergreen answer to every blandifier’s prayers, is being cited in support of this vandalism. The brochure promises to “increase the total amount of retail space" - not necessarily a bad thing, and it does seem from the plan that the new shops will still be quite small. Good; but I have a nasty feeling that they may not stay small in the finished scheme. The main difference from the 2006 scheme is that instead of being “luxury flats,” the new buildings around the market are now to be a 100-room “boutique hotel.” A hundred rooms is actually almost 25% more than at the existing town centre hotel, the Ibis, which has 82 rooms. A hundred rooms isn’t a boutique, chaps – it’s a department store. What will the new hotel buildings be like? If they are supposed to be in place by the Olympics, that doesn’t leave much time for niceties like decent design and careful construction. They are high, at least four storeys, potentially overshadowing the listed buildings on Church Street and King William Walk. My concern is that they will be the same kind of blank structures that line the pedestrian passage at Cutty Sark DLR station, and that the public spaces between them will be as charmless as that passage. The hotel, in fact, could be where the Hospital’s grand plans prove, in the end, unworkable. Greenwich Council may never have shown much concern for the town’s heritage – but I don’t imagine (I could be wrong about this) that they want Greenwich to be an even worse traffic jam than it is already. The main entrance of the hotel could cause just that. It will be right on the busiest part of the one-way system, on King William Walk. The Hospital claims that most guests will arrive by public transport – surely nonsense. Few people carrying luggage for a stay in an expensive hotel (I think we can assume this hotel will be expensive) want to, or can, carry it on public transport. Most will arrive by car, by taxi or perhaps, if they are in a party, by coach. There is nowhere to unload such vehicles except right in the middle of the traffic flow (and the hotel entrance also has the distinction of being opposite a bus terminus, further narrowing the available space.) Rather like the fluttering butterfly wings in South America which caused the proverbial earthquake in Japan, the arrival of a coach containing fifty tourists and their luggage in Greenwich will be felt all the way back to Tower Bridge. That fundamental change, as I’ve suggested, remains. But Mr Raynsford now seems less unhappy about it. He’s one of the “stakeholders” that the Hospital’s PR firm has managed to butter up. Ray Smith, from the Greenwich Society, is quoted by the PRs as saying that the proposal will “help revitalise Greenwich town centre.” But it is impossible to see how the market - teeming, buzzing, thronged - could be any more vital than it is already. Indeed, in 2006, a certain Nick Raynsford told me: "The market is hugely popular. You only have to go down there at the weekend to see that it's absolutely packed and it makes a big contribution to the character of Greenwich." So what's changed? Perhaps the local worthies have been persuaded by the results of the “consultation” the Hospital conducted. They shouldn’t be: the questions were so loaded as to be almost worthless. The lack of fuss, so far, can also be explained by some of the core reassurances being made about the development. The latest brochure claims that “the overall objective of the plan is to maintain all the principles of Greenwich Market.” There’s only one problem with this: it is just not true. But the Hospital’s need to say it does unwittingly reveal another truth: that it knows most people in Greenwich do want to “maintain the principles of Greenwich Market.” If you are among them, it is time to start objecting to this principle-destroying development.